Pulling or straining a muscle during a workout is painful and frustrating. 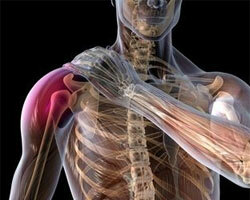 It occurs when a muscle is stretched too far or too fast and muscle fibers are damaged. Muscle related injuries are very common and happen nearly to everyone, from professional athletes to those who only workout occasionally. Most injuries do not require medical attention, and all you need to do is to control the pain during first 24-72 hours. Rest: Avoid any physical activity that involves the affected area. Forcing yourself through the pain will cause further damage of the muscle and will make things worse. Ice: As soon as you can apply ice or an ice pack on and around the injured site. This will help to reduce swelling and pain. Keep it on for 10-15 min, give it a break for at least 10 min, and then reapply. Repeat 6 to 8 times during the first 24 hours. To prevent the frostbite avoid applying the ice directly to the bare skin. Always use a washcloth or a towel as a barrier. Compression: In many cases, compressing the affected area will significantly reduce the pain. Elevation: Another way to reduce pain is to keep injured part of the body elevated. It might not always be possible for you to do it during the day. However, you can try it before going to sleep, by putting a pillow or a towel under the affected site. Therapeutic massage is a combination of various therapeutic modalities specifically designed to directly address problems caused by injury. The aid of these techniques is essential if you are looking to recover as soon as possible and expect the affected muscle to perform as well as it did before. Receiving Therapeutic Massage Treatments ensures much faster recovery, and results in a healthier muscle that is elastic, flexible and has a minimal amount of scar tissue. Try Therapeutic Massage and you will get back to your fitness or training program in the shortest time possible! Therapeutic massage is not recommended during the acute stage, but after its over, you can focus on ensuring quick and healthy recovery of the affected muscle. Massage will be an excellent tool to speed up the healing process.